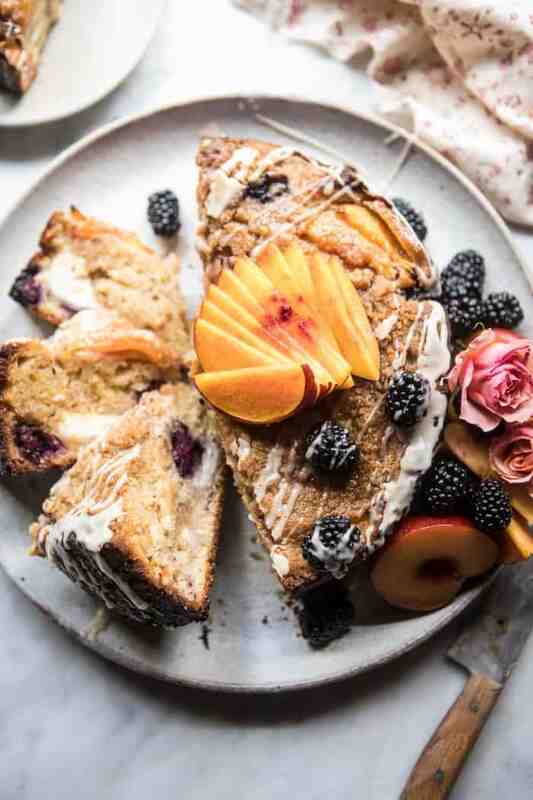 Vanilla Glazed Blackberry Peach Coffee Cake. 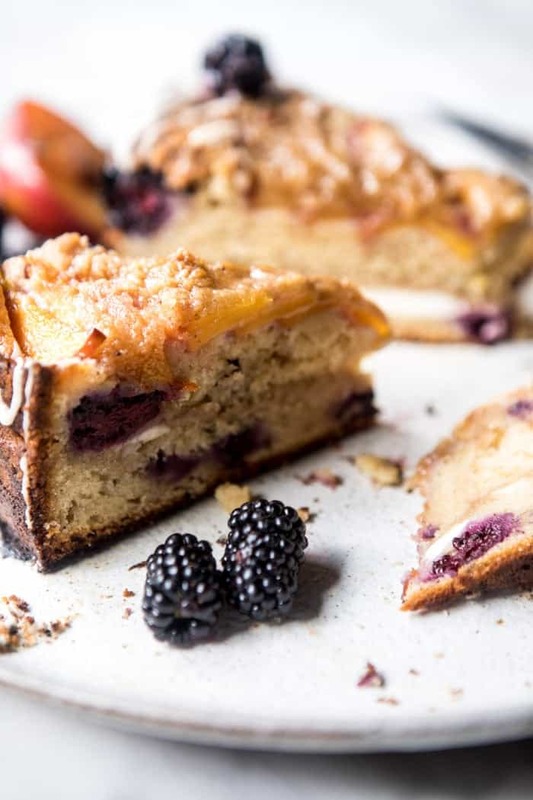 Ending the week on a high note with this vanilla glazed blackberry peach coffee cake. Can you say yummmm?!? Hey, hi! Happy Friday everyone! Pretty pumped for the weekend, as it’s been a stressful week over here. From family stuff to work stuff to taking care of all of these animals, this week has been jam-packed, but I’m excited to be sharing this cake with you all today. One, because I think all Fridays should end with something sweet. 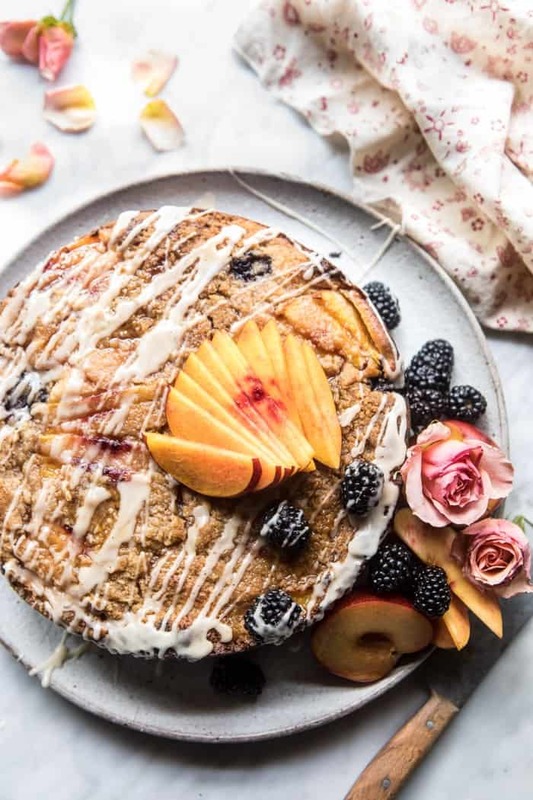 And two, because looking at this cake just puts a smile on my face…hello to all that sweet summer fruit and those pretty, pretty flowers. The combo of fresh fruit + flowers will forever make me happy. Speaking of flowers, they always make me think of my grandma, aka Nonnie. If there’s one thing that my Nonnie passed down to me, it’s a love and appreciation for flowers. When I was a kid, she’d take me to the garden store to help her pick out her summer garden flowers. And when it was winter, we’d always buy a fresh bouquet from the grocery store…every time we went. Buying flowers was something my mom never did much of, mostly because she felt guilty spending the money. But Nonnie? Oh no, they made her happy, so she bought them. I used to love heading to the store with her because she’d always let me pick out whatever I wanted (Gerber Daisies were my favorite back then). So, if you ever wonder why I am so flower obsessed, you can just thank my Nonnie for spoiling me with them as a kid. She’d even put them by my bed when I slept over, or when I visited them in Florida…the best. Lastly, while we’re still on the subject of my Nonnie, I just want to say a big thank you to everyone who has commented or emailed. Your kinds words mean everything to my family and I. Thank you all so much! This cake is the essence of summer. And even though we are having some seriously cold days over here in the mountains (like cold, I could see my breath every morning this week), I’m trying my best to stay in that summertime mode. All the fruit at the store and at my local farm stand are helping. 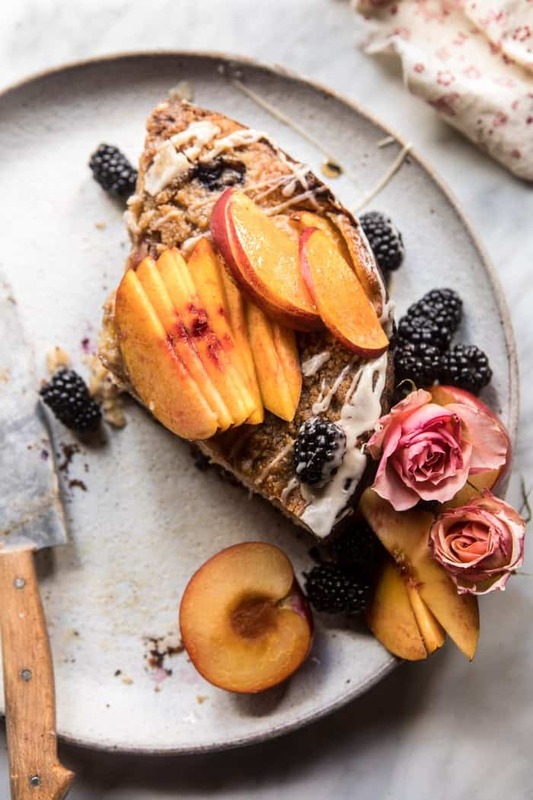 We have a bunch of end of summer recipes planned and this cake is just the beginning. Meaning I hope you guys are not sick of peaches, nectarines, berries, tomatoes, and zucchini yet, because there are plenty more recipes coming your way. 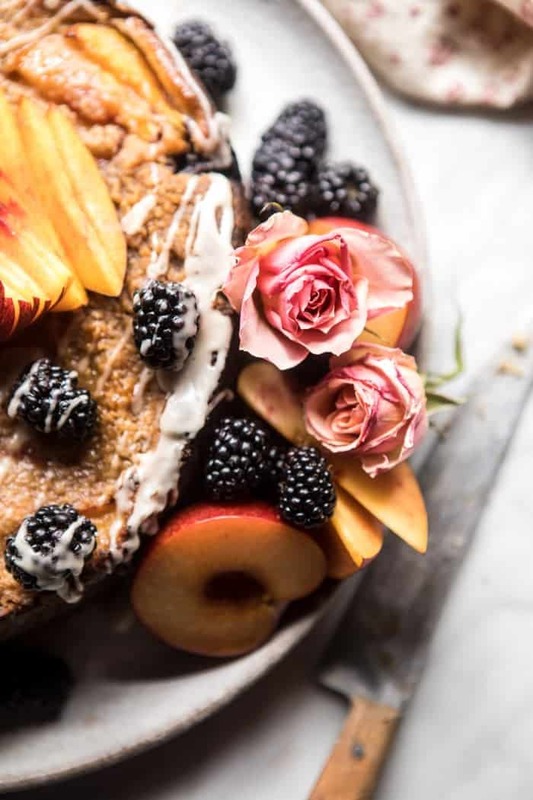 This cake is hard to beat, again, all that fruit, everyone over here can’t get enough. 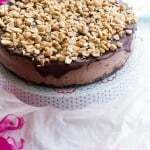 The base of the cake is similar to other coffee cakes. It’s moist as can be due to the greek yogurt and sweet butter, it has just the right amount of crumbs, and double the streusel. 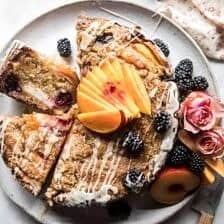 Unlike traditional coffee cake however, this coffee cake is studded with fresh blackberries, swirled with cream cheese (yes, yes, yes, cream cheese, it’s so delish), and topped with sweet peaches (or nectarines, I used a combo of both, but you could even use some plums too) and a brown sugar streusel. It. Is. Incredible. Just so deliciously good. You have to make it. Enough said. Wait, one more thing! 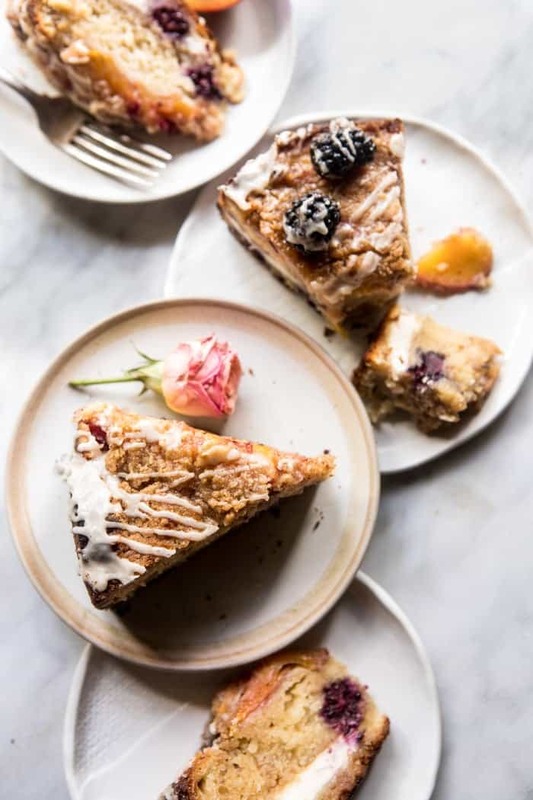 I know a lot of you are probably trying your hardest not to turn your oven on this month, but sometimes it’s worth it, and I am here to say that this cake should be your exception…so very worth it. 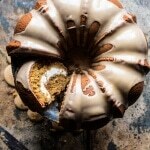 This coffee cake is too delicious to not have! 1. Preheat the oven to 400 degrees F. Grease a 9-10 inch spring form pan. 2. In a large bowl, cream together the butter, brown sugar and vanilla until fluffy, about 5 minutes. Add the eggs, one at a time, until fully incorporated. Add the yogurt and milk, beat until combined. The mixture will look curdled, this is fine. Add the flour, baking powder, and salt and mix on low speed until just combined, making sure the batter is completely mixed. Gently fold in the blackberries. 3. To make the streusel. In a medium bowl, combine the flour, brown sugar, and cinnamon. Add the butter and use your fingers to mix the butter into the flour until a crumble forms. 4. Spoon half the batter into the prepared pan. Gently dollop the softened cream cheese over the batter and spread in an even layer. Sprinkle 3/4 of the streusel over top of the cream cheese. Spoon the remaining batter over the streusel and carefully spread in an even layer. Arrange the peach slices over the batter and then sprinkle on the remaining streusel. Transfer to the oven and bake for 45-55 minutes, or until a toothpick inserted into the center comes out clean. If needed, cover the cake with foil to prevent too much browning. 5. To make the glaze. In a small bowl, stir together the powdered sugar, butter, vanilla, and 1 tablespoon water until smooth. If needed, thin the glaze with a splash of water. 6. Drizzle the glaze evenly over the cake. 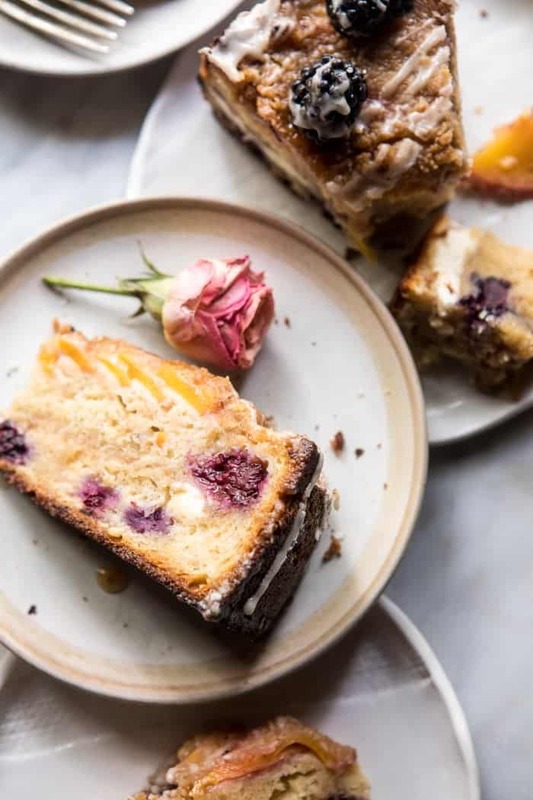 Serve cake slightly warm or at room temperature. 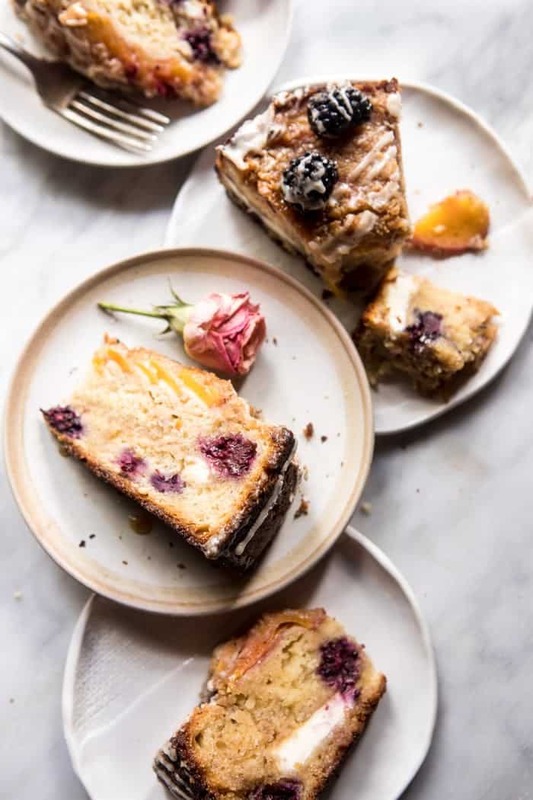 Keep cake stored, covered in the fridge. We will never get tired of you bringing wonderful recipes with peaches, nectarines, tomatoes, and zucchini. The cake looks so yummy!! Haha I am so glad about that because they’re my favorites! Thanks so much Carlos! So sorry about Nonnie 🙁 It’s so beautiful you’ll always share this flower bond with her and have her around you in that way. Thank you Alice. I am really lucky to have such great memories with her. I hope you love this cake! So sorry to hear about your Nonnie. What a lovely thing to buy flowers for yourself and your family! All the best and strength to you and your family. I am definitely not tired of summer produce recipes! So far your summer recipes have been great, can’t wait to see more! Thank you Marian that means a lot to me! I am so glad you’re not sick of them! This looks absolutely fantastic! I adore the touch of roses as a decoration. And the cream cheese layer – oh, the best! Your photos are pure perfection as always, I’m drooling over my keyboard here. Really sorry to hear about your Nonnie, she must be the nicest person under the Sun. The little things like buying you flowers make a strong bond between relatives. I really hope she will get better. Wishing I had a slice of this to go with my coffee right now! The addition of cream cheese puts it right over the top. It’s nice to know where your love of flowers has come from and so special that you will always carry that with you. Oh…and I haven’t had my fill of all the summer recipes yet! There’s plenty of time for Fall. I made this yesterday…and wow! The cream cheese layer really makes it. One thing I would suggest to is to add the milk and eggs at room temp otherwise the creamed butter/sugar mixture seizes up which is what happened to me. I’m sitting here now enjoying a piece with my coffee! Thank you for the recommendation on the room temp milk/eggs. Seemed to work! That would be the perfect morning to me! So glad you are still into summer recipes! Woo! Thank you Jean! Ooo that cake sounds yummy!! Especially with fresh blackberries! Thank you Angelia, I hope you love this cake if you get a chance to make it! Made it today, so amazing! Other than a mishap with the mixer and getting poison ivy from picking the blackberries yesterday, it was easy and oh so yummy. Sent my Mom home on the plane with a few pieces for breakfast tomorrow. OH no! Poison ivy is not a fun thing to get, but at least you had some coffee cake to get you through it haha! I am really glad you like the cake Christin! Woo! I hope you love it Christian! Love your blog… but ENOUGH tomatoes. I hate them and between you and every other blog, I’m over it 😉 the rest can stay! 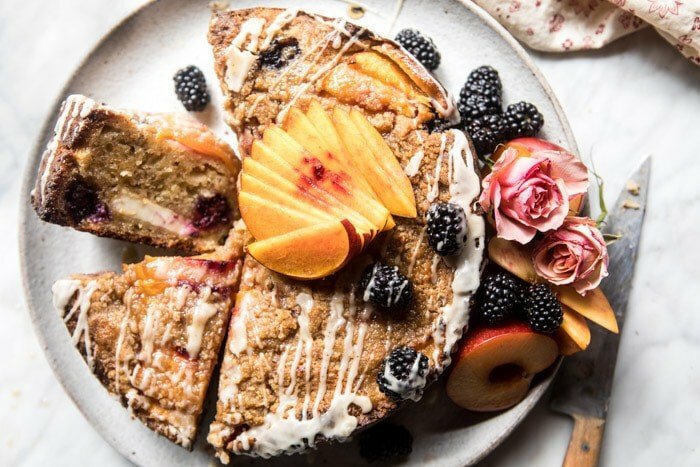 This looks delish and I think I’m making the PBJ muffins with my kiddos this weekend. Haha I get that. They’re just some of my favorites in the summer, so I love to use them! I appreciate the honesty though! 😊 I hope you and your kiddos LOVE the PBJ muffins & let me know how they turn out for you! Yum! Those are my two favorite summer fruits! Ah you and me both! I hope you love this Kari! Hi, I am just drooling over your recipes for the past few weeks since I discovered your blog. This cake is so tempting that I want to throw my phone and start baking it. However being in tropical country we don’t get these fruits easily. Lots of love and keep making such great stuff!! Awh, well I hope you can find these and make this coffee cake haha! I am really glad you love my blog Anuradha and I hope you continue to! Thanks so much! Thank you for the beauty ! I wish I could see my breath: it’s 102 F here. Pinning for later. Thank you so much ! Wow! That is so warm.. but I must say, I’m a bit jealous haha! I hope you love this cake, thank you! HI Anne, 1 tablespoon of butter is 14.18 grams. Let me know if you have questions. Hope you love the cake! Cake is baking right now. Wow! Thank you. I can’t wait to eat a big slice with coffee. The cream cheese layer will be an awesome, delicious addition. I too love flowers, especially roses. I cut some to add to my table vase in my home daily. I hope you absolutely love this Mary! Thank you so so much! 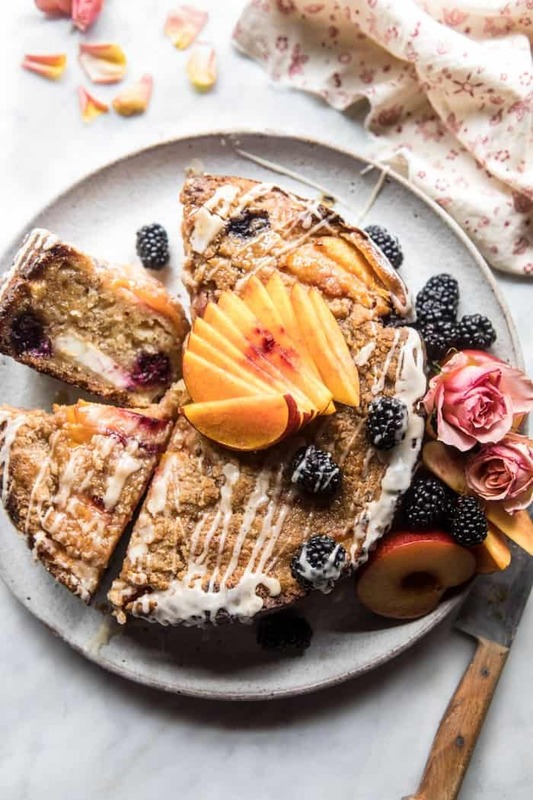 Such a pretty coffee cake! 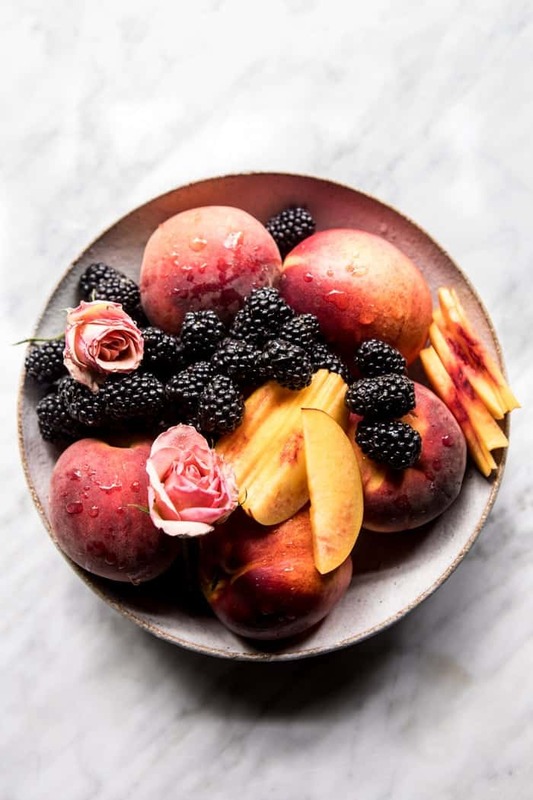 Peaches with blackberries is the best! Thank you Laura! I am so glad you like this! 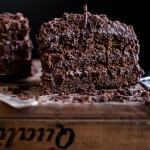 I love your recipes; I probably make 2/week and they have been, without exception, wonderful. But this cake was problematic for me. I made it over the weekend in a friend’s kitchen and I didn’t have my usual equipment (felt like I was back in Colonial times!) and the cake just didn’t come out right. Tonight, I made it again but in my kitchen – carefully following each step, and with the freshest ingredients. When I added the yogurt and milk, the “batter” looked curdled and I could never get it to the “smooth and creamy” stage. I decided not to go further and possibly waste the remaining ingredients. So…what might I have done wrong? Has anyone had this problem? Does anyone get it to that smooth and creamy stage? Maybe you should add – “beat until smooth and creamy, although is may look curdled which is fine.” That’s clearer to me. So, I’m charging on and making it again this weekend. I appreciate your response! Karen, I had the same problem but it was because the creamed butter and sugar mixture was room temperature and then when you add the cold milk, yogurt and eggs the butter gets cold and clumps together again. If you bring the milk, eggs and yogurt to room temp and then add them it should stay creamy. Thanks Karen Great tip! Hope you love the cake! I am so glad you enjoyed this Kelsey! Thank you! I can’t wait to make this! It looks amazing. I don’t see cream cheese in the recipe, how much do you need for the cake? Hi Lauren! It is 8 ounces of cream cheese. I hope you love this! Thank you! This is a great recipe. I’d like to know if I can use fresh blueberries in lieu of the blackberries. 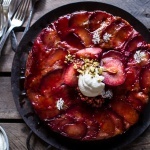 Also, I’d like to bake it early because I have fresh fruit; how long can I refrigerate and/or freeze, without the glaze?